Product Consists: Basket Arrangement of 20 Mix seasonal flowers (Roses, Gerberas, Carnation, Lilies and Orchids) Arrangement with some fillers, 16 pcs of Ferrero Rocher Chocolate along with 1.5 Kg Heart Shape Strawberry Cake. Giftacrossindia.com brings to you a very special gift combo which is just perfect for any occasion. 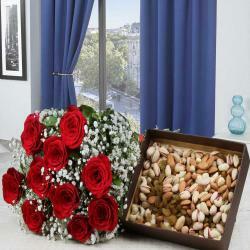 This hamper has meanings to create a memory for life time at your loved ones life. Gift mean that you can share your feeling to someone who is very special. This gift combo is all set to elate the receiver. This hamper makes for a fabulous gift when it comes to occasions like Birthday, Anniversary, Best of Luck, Durga Puja, Womens Day. So go ahead, place your order now for this fabulous gift combo. Product Consists: Basket Arrangement of 20 Mix seasonal flowers (Roses, Gerberas, Carnation, Lilies and Orchids) Arrangement with some fillers, 16 pcs of Ferrero Rocher Chocolate along with 1.5 Kg Heart Shape Strawberry Cake.